What's better than running on an ideal weekday evening, one where the weather is already begging for an evening spent outside sans massive sweating? Running with Chicago Bear Charles Tillman outside on an evening that couldn't be more perfect for running (watch the temperature drop as the day wears on, just my luck). I'm already hyped up for the Soldier Field 10, a favorite among Chicagoans who run to start off their Memorial Day, but that doesn't mean I won't welcome the excuse to think Bears and football ahead of time. Even if I still can't run. Plus the 5:30 p.m. start for the event--6:30 p.m. for the run portion--means there's still plenty of time to make it back home to watch the end of the Biggest Loser finale, if you're like me and anxiously waiting to see if the winner will be Hannah, Irene, Jay or Olivia. Or set the DVR and watch it later because this run party's going to last far longer than that 2-hour show. You'll get to hear Tillman speak about his foundation, which he started in 2005 after his youngest daughter was diagnosed with cardiomyopathy. You'll learn about the reasons to run for The Cornerstone Foundation as a fundraising runner. Good to know considering the Cornerstone Foundation has hard-to-grab Chicago Marathon entries, either for those who want to run for a charity and missed registering for the race, or who are running but still want to select a charity to run for. You'll learn about the training benefits and prizes and perks you can receive for running on behalf of The Cornerstone Foundation for the Chicago Marathon. You'll learn about what raising money can mean for the foundation's efforts to help the ill kids in Chicago. 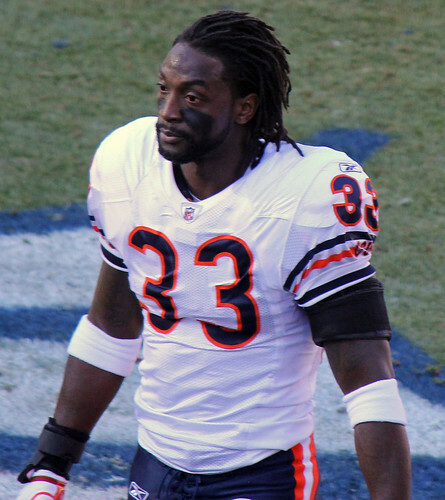 You can bring your best Bears gear for Tillman to sign (within reason according to the invite). You'll party after the run at Fizz Bar and Grill for a pint of beer thanks to Goose Island Brewery. You could a raffle prize and go home with an item signed by Tillman--expect other prizes, too. A $5 minimum suggested donation will go directly to the Cornerstone Foundation, which you probably wouldn't feel bad about handing over after hearing their story. If you are running tonight, have fun and enjoy the festivities. I'm jealous to say the least since I thought I'd be able to test my recovered leg at this 3.1-miler. Not going to happen since I won't get the doc's prognosis for another 48 hours. But that's not to say I don't want to hear about the event. Pictures, stories, you name it--because Tillman is one Bear I'd want to meet. Photo grabbed from Jeffrey Beall at flickr.